Ages 3 and up. 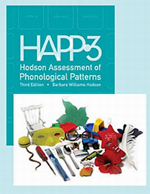 This instrument is a revised, expanded edition of the Assessment of Phonological Processes that can be used with children or adults. The instrument includes normative data and can be helpful in identifying the specific phonological patterns used by individuals with speech disorders. The manual includes descriptions for major phonological processes and guidelines for scoring responses. The third edition (formerly APP-R) is now norm-referenced as well as criterion-referenced. The HAPP-3 stimulus words and transcriptions have been "internationalized." Two screening components are included Multisyllabic words and Preschool. Objects that conform to the choke-proof guidelines recognized by the U.S. Consumer Product Safety Commission are now included in the HAPP-3 kit. comprehensive evaluation analysis forms that are larger and "user friendly." obtaining scores for documenting treatment effects over time (for evidence-based practice). Two screening tools also are included (12 stimulus words for each). Productions are transcribed, analyzed, and summarized on either the Preschool Phonological Screening Record Form (for children 2 years of age and older) or the Multisyllabic Word Screening Record Form (for students 8 years of age and older). The screening instruments, which can be administered in less than 5 minutes, yield results that help the examiner determine whether further testing is needed. The Manual includes explicit instructions for administering and analyzing the HAPP-3. Examples of the deviations are provided, and coding instructions are explained. The manual also includes a chapter about phonological intervention principles and procedures. Tables for converting Raw Scores to Ability Scores and Percentiles (to qualify a child for treatment services when required) are in an Appendix. The complete kit include the Test Manual, 25 Comprehensive Phonological Evaluation Record Forms, 25 Major Phonological Deviations Analysis Forms, 25 Substitutions and Other Strategies Analysis Forms, 50 Preschool Phonological Screening Record Forms, 50 Multisyllabic Word Screening Record Forms, 1 Multisyllabic Word Screening Picture Sheet, 30-piece Object Kit, and 13 Picture Cards.